Ecclesiastes says nothing about “God’s love.” It is silent about His compassion and sympathy for hurting and ailing human beings. It lacks every indulgence of our present-day maudlin self-preoccupation. Instead of being warm, uplifting and positive, its message is cold, harsh and negative. How could something that is so insensitive to our pre-defined emotional and psychological needs possibly have anything useful to say? Not surprisingly, while Christians may accord it a place in their Bibles, they scarcely find room for it in their hearts and minds. For most, it remains a closed book. We ask a text to fit our mold, and if it doesn’t, we either relegate it to the background or mystify it (as seen among the “Jesus is the answer” crowd). Pick any of these approaches taken by most commentators, writers, and preachers, and they all seem to miss something – Ecclesiastes is a divinely inspired covenantal document representing the worldview that weaves through the whole canon of Scripture. No matter the approach to the book, something that slaps the reader in the face is the theme of vanity. The problem with the methods of interpretation above is that they apply the vanity to the wrong things. In the first Chapter of Part 2, Prologue: The Root of the Problem 1:1-11, Michael W. Kelly points out some helpful points to guide us in understanding what exactly is vanity, meaningless, or utterly useless. The root problem of vanity is not our creaturely-ness or mortality, but sin. Uselessness is not inherent in getting wisdom, governing a country, saving, spending, and all the other activities covered in Ecclesiastes, but uselessness is going about these things with man-centered motives and means. Ecclesiastes is a book that attacks the wisdom of man in every endeavor and calls the covenant community to walk out all of life with the Wisdom of God. The first section is putting together the covenantal worldview of Scripture, the wisdom of Solomon weighed against the wisdom of pagan nations, and the wisdom of Christ and antithetical wisdom of the Greeks. Let’s summarize the sections of this first part. God’s wisdom is seen in creation and redemption. The wisdom of Solomon (which was given directly by God) is contrasted with the wisdom of Egypt and Mesopotamia. Through Kelley’s comparison, it is quite clear that the covenantal wisdom of God surpasses pagan wisdom in the realms of religion, philosophy, and civil structure. The wisdom of Solomon, which far excelled pagan wisdom, is outshined by the Wisdom of Christ. Christ is the Wisdom of God personified. The supreme wisdom of Christ is then shown to embarrass the wisdom of the Greeks. The second part of the book deals with the exposition of the book of Ecclesiastes. Part one was preparation to understand the worldview undergirding this text of Scripture. Below is an example of Kelley’s exposition of Ecclesiastes 3:10-15 (in italics, comments added are mine). But the Preacher does not leave matters there. He addresses the covenant people with positive words of hope. Reminding them of “the burden of God” (v.10), he directs their thoughts to God’s covenant faithfulness—“He has made everything beautiful in its time.” (v.11) It is his way of saying that God will ultimately make all things beautiful in time. God can do so because He alone is lord of man’s time. It is not their task, then, to be gods over time. They must entrust themselves to God instead of attempting to “fathom” God’s doings. God is faithful in difficult times, and His faithfulness is the promise that assures us of covenant blessings for our faithfulness. However, this is no encouragement to idleness and passivity, for the Preacher issues a positive order for what God’s people should do with the time God gives them. “…there is nothing better for [covenant] men than to be happy and do good while they live…[to] eat and drink, and find satisfaction in all his toil—this is the gift of God.” (vv. 12f) God calls His people neither to control time nor to escape time, but to use their time “while they live” to do good. Thus, the fruition of God’s faithfulness in time is no reason for slack hands. As covenant people, we can work, eat, and be happy with satisfaction that our faithfulness to God in all these things is not vanity, vaporous, or useless. The doing good which we are to be satisfied with is none other than the Law of God. David, Solomon, and Christ’s wisdom have the same ethical standard of good – the revealed Law-Word. Our doing of His will is the doing of God through representation. The lawful works of God’s people endure forever. The wickedness that we remain faithful under will be punished in due time, on earth and in heaven. Time is the opportunity to mature into the full man, Jesus Christ. We do not fight the fight of faith to hold our ground, return to a past state, or hold our ground. We put sin to death sin in Jesus Christ, fight tyranny and injustice with obedience to God’s Law, and we march forward in hope. One thing I would like to see after every section of explanation would be ethical/judicial applications for self-government, family government, Church government, and civil government. 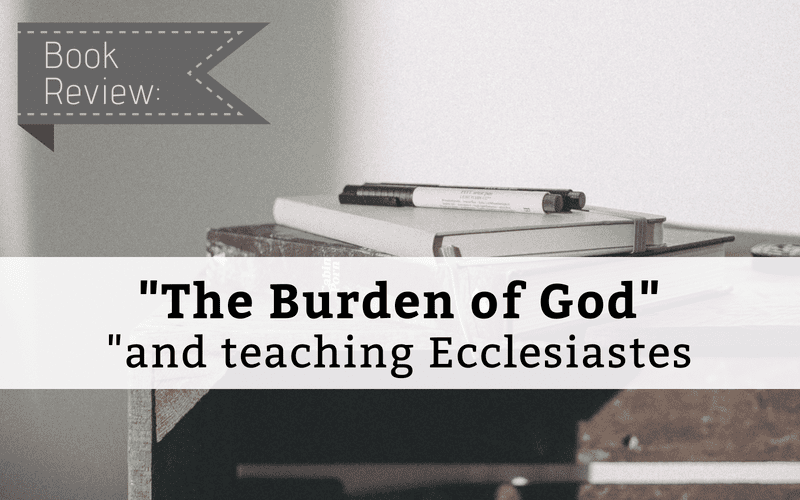 Those questions could be a great project for someone to publish – an applicable study guide to Ecclesiastes based on the exposition from The Burden of God. If I ever hear one of my friends say they are going through this book of the Bible for self-study, Sunday School, or a sermon series, I will throw this book into their lap (or email them a pdf).